Energy carriers are gaining a central role in the panorama of energy production systems as they can be considered a viable answer to environmental sustainability while accomplishing supply security issue. Coupled with advanced combustion technologies, they are synergistic twin strategies that can satisfy the requirements of geo-political and environmental sustainability and security. A Smart Energy Carrier (SEC) identifies any molecule (derived from standard, alternative or unconventional sources) locally produced or made available to be safely and cleanly transformed into energy by means of the best accessible combustion technology. The study of SECs related to their use in combustion-based energy production systems, in all its aspect, has been so far the framework within the networking activities of the SMARTCATs COST Action. The network has grown over the years and after several successful Action meeting, it is compelling to organize an international conference on Smart Energy Carriers. The first International Conference on Smart Energy Carriers will take place in Naples on 21-23 of January, 2019. 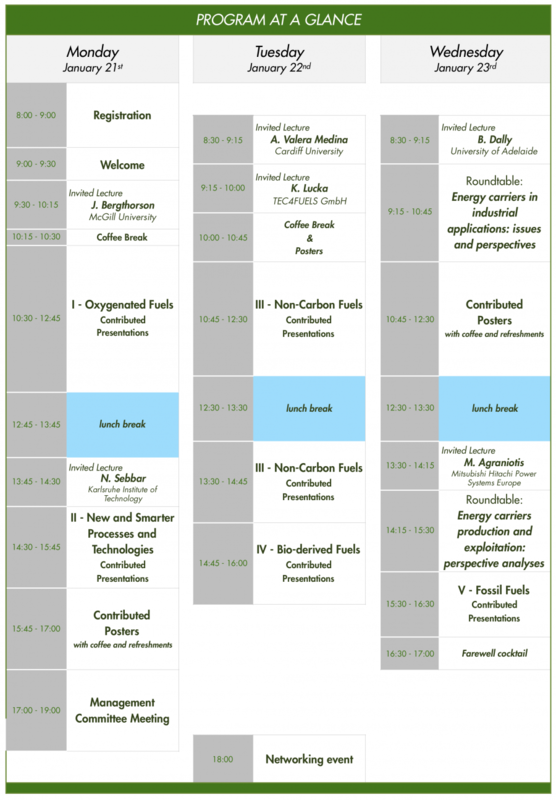 This Conference will also be the last General and Committee Members meetings of the SMARCATs COST Action. The main aim of the Conference will be to point out (Smart) Energy Carriers Chemistry and Technologies current state of knowledge and perspectives. Invited lectures as well as contributed presentations (from both Action participants and all the interested researchers) will be arranged in a three days conference attempting to give the largest possible room to discussion and interaction among the participants. For all these energy carriers contributions on oxidation chemistry and kinetic, pollutants characterization, formation and abatement, diagnostics for SECs studies and application, SECs combustion processes and technologies and Industrial applications are all welcome. The venue of the Conference will be the Congress Center of the University Federico II. All the invited lectures and the contributed presentations will be given in the “aula magna” at the first floor of the Center. Coffee breaks, lunches and poster sessions will take place at the third floor of the building. The congress center is located in the Santa Lucia area at the center of the Naples roadstead waterfront. The Congress Center is close to the city center and to the main artistic and cultural sites. The area of Santa Lucia corresponds to the original seashore of the first Greek settlement (Palepolis). It is in front of the Megaris island where along the centuries the “Castel dell’Ovo” fortress were built. In the program preparation the authors preferences for oral or poster presentation have been followed when possible. In a very few cases we had to move a paper to poster session in consideration of the limited amount of oral presentation slots available. As it was announced, the main aim of the conference is to promote the interactions among participants. According to this criterion, posters will be in display during the whole conference duration and there will be the opportunity to discuss the posters during three dedicated sessions and lunch/coffee breaks. Please note that at least one of the authors is requested to be present at the posters during the scheduled poster sessions. Since oral presentations will be only 15 minutes long there will be a limited amount of time for a few relevant questions from the audience. There will be plenty of time to interact and discuss among participants during poster and others social activities! Poster size is 90×120 cm (WxH). Identification numbers will reported on the poster boards. The room where poster sessions, coffee breaks and lunch will take place is located at the third floor of the congress center. For any particular request concerning presentation scheduling or other issues concerning the program please contact us using the email: cm1404webmaster@irc.cnr.it. Synthetic Fuels – the Wild Card for the Energy Transition? are available as a zipped download by clicking HERE. All the participants to the meeting will have to register (paying a €150 flat fee) to be admitted to the scientific sessions and participate to the networking event. Accompanying people should separately register, using the same registration website and paying a reduced registration fee, if they plan to participate at the networking event(s). Registration service is handled by M.C.M. Congressi on a separate website. On-site registrants will have to pay by cash due to logistic issues. Any special request concerning registration, receipt issuing and payments must be submitted by email or phone (+390817611085) to M.C.M. Congressi. A cultural/social event is programmed in the afternoon of Tuesday 22nd. 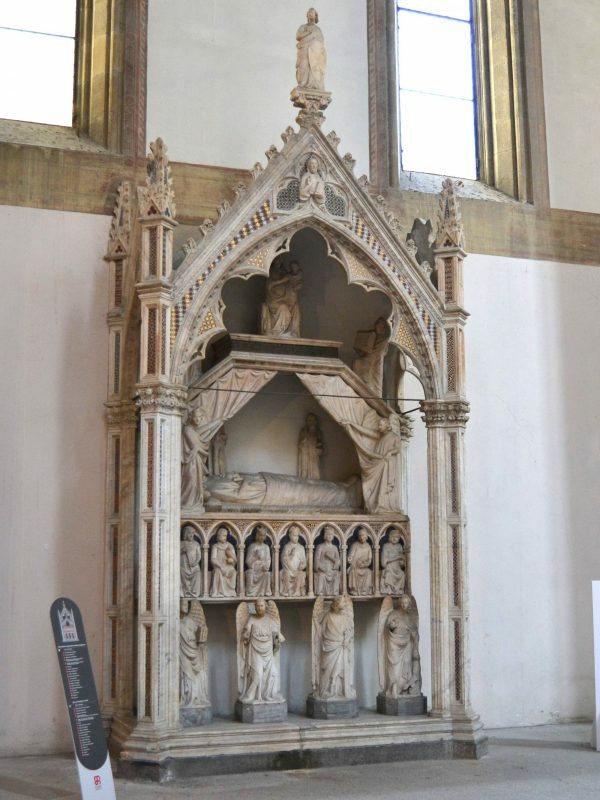 A guided tour of the “Donnaregina Monumental Complex” will take place and a relaxing reception will be offered to the registered participants in the thirteen century gothic church. A bus service will be organized. Buses will depart from the conference venue and will take back participants to the same place after the event. Last bus to Donnaregina will depart at 17:30. The event will last for about 3 hours from 18:00 to 21:00. Those wanting to arrive to the event site by walking through the old Napoli city center can use the “Google map reference” of Donnaregina Monumental Complex as an useful aid. Please confirm your participation at registration desk at your arrival and possibly by Monday 21st. Support to the Action participants will be given according to the usual COST rules and the provision of the Action budget plan. Management Committee members are eligible for a reimbursement up to a maximum of €820.00 . The reimbursement include travel, accommodation (flat rate of €100.00 per night) and meals (flat rate of €20.00 per meals when not provided by the local organizer). At most one registrant per oral/poster contribution will be considered for a reimbursement up to a maximum of €820.00. Selection will be on the proviso of maximizing the number of participating countries/entities, on a first come-first served basis and in the limit of available funds. The reimbursement will include travel, accommodation (flat rate of €100.00 per night) and meals (flat rate of €20.00 per meals when not provided by the local organizer). The support notifications from e-cost platform will be issued by December 15th. The registration to the event does not imply the COST Support. Further support may become available in the future. For information, please, contact the Grant Holder Manager.